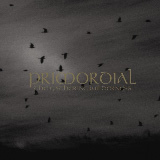 After re-releasing their first demo along with some bonus tracks last year, Primordial have returned this year with a brand new offering of Celtic Pagan Metal. Things have changed since Storm Before Calm, which I also reviewed here. Where as Storm Before Calm was a departure from Spirit The Earth Aflame, with its primarily Black Metal vocals, more blast beats, and more traditional Black Metal elements, this CD goes back to more of the Spirit The Earth Aflame sound. Is the result successful? I would say yes. I prefer this style of Primordial over their sound on Storm Before Calm, and it would appear most would agree as this CD is getting really high scores throughout the metal community. Do I agree with these high scores? Let’s find out. The first thing that is very apparent to long time listeners of Primordial is that unlike the previous effort most of the Black Metal vocals are gone. They are still there but The Heretics Age on the last CD had more harsh vocals than this entire CD combined does. In a way this is a good thing and a bad thing. It’s a good thing because one of my complaints of Storm Before Calm was that there weren’t enough clean vocals… well, looks like I got my wish. The vocals from A.A. Nemtheanga are very unique as they have folkish sensibility and feature enough emotion and anguish that a lack of technical skill is completely excusable. So it’s great to hear more of these awesome clean vocals but now there is some variation lacking due to the Black Metal vocals taking a back seat (it should be said that Nemtheanga uses a gruffer style to accentuate vocal lines, however). In a way this goes along with the music better I suppose, but I enjoyed more regular trade offs of the vocal styles as opposed to occasional harsh vocal moments. Secondly, the overall sound is more subdued. It’s not as aggressive or as angry as Storm Before Calm was. There are some double bass moments and up tempo sections but The Gathering Wilderness has the feel of largely mid-paced CD. This does suit the riffing style which is commonly found in most Pagan Black Metal bands such as Graveland or Beserk (Spain), but Primordial have their own little subtleties that separate them from the Gravelands of the Black Metal world, including but not limited to acoustic guitars. To clarify, Primordial songs tend to have a large scope of emotions and moods but the arrangements aren’t as epic as a band like Graveland. Sure, pretty much all songs have a similar riffing style but it what defines Primordial’s sound as much as the vocals. Few bands can create such a broad range of emotions with their riffs; they really are mesmerizing and instantly stick in your head the minute you hear them to the point where you catch yourself humming along to every melody in the song. A lot of Black Metal bands have those riffs that get engraved your brain but Primordial has a certain melodic sensibility that creates a unique atmosphere and listening experience that you’ll only find on a Primordial CD. Moreover, with this more subdued form of song writing the atmosphere is more readily apparent… it was still there on the faster sections of Storm Before Calm but you had to really listen to the music to hear it amidst the fast sections, where as on this release the music will grab you immediately. That’s not to say that The Gathering Wilderness is a simple CD because with repeated listens you can hear new things every time, especially since all the tracks are over the 8 minute mark. I’ve played The Gathering Wilderness, at the time of this review, about 7 times now, with my 7th listen being right now and I’m still hearing new aspects to the music and the arrangements, a lot of which is very subtle folk influences. As always the lyrics are excellent, being very well written and equally well delivered. They tend to deal with historical aspects or at the very least, melancholy themes. The production, as mentioned isn’t raw, but it’s not clean either. The guitars have a gritty tone to them that is at once dark and not overpowering. The result is what I would describe as the perfect sound for the riffs being played. Everything just adds to the bands atmosphere, and I do mean everything. It’s an overall contribution of every instrument, the production, the vocals, and lyrics that make Primordial what they are. I’ve been listening to this band since around ’99 and in my opinion this is their best work yet. It’s their most consistent and emotional work and though everything is more downcast than previous releases it lends itself to an even more powerful atmosphere and tone to the CD that you won’t really find anywhere else. This isn’t your run of the mill Black Metal band but I guess I would recommend Primordial to Black Metal fans first… but anyone who likes melancholic, intelligent, and emotion filled Metal check these guys out. So I guess my conclusion is that I agree with the praise this CD is getting, but it didn’t come as a surprise to me because Primordial always had it in them, but it took a slightly different approach to make it happen.